I usually always buy butternut when I get the inkling to buy winter squash. How butternut became my squash by default is not a mystery. It’s nutty, buttery, and the aroma is mild when you slice it in half. No matter how you cook it (boiled into a creamy soup, roasted until caramelized or baked and whirled into a smooth and soothing butternut purée) butternut squash has always been my favorite. Shopping at the squash display the other day I made a decision to break out and try something new. I decided to buy three delicata, one for each of us. Buttery, nutty and no need to peel! The thin skin makes preparation easier than most winter squash. After roasting, the skin can be eaten with the flesh, providing a nice contrast in texture. Try this savory roasted delicata squash. It just may become your new favorite gourd too. Preheat oven to 425°F. Slice squash in half lengthwise, remove the seeds, trim the ends off and chop into bite size pieces. Place all ingredients in a bowl and toss. Place on a roasting pan and roast for 15 minutes, toss around and roast for 15-20 additional minutes until nice and golden. I havent seen one like it. I should look for this delicata squash with soft skin. Although it might be difficult since it is summer over here unless we import it from over there! HI Dolly! Yes, I think I would stick to summer squash right now if I were you. :) Maybe this winter? Hope you are enjoying your nice warm weather…it’s damp and cold here in Seattle! I am loving this Seana… I’ve never seen this kind of squash…or maybe I have, and just haven’t paid attention. Well, now I’m paying attention! It looks so lovely, so delicious. What really surprised me is that you don’t have to peel the squash! I’m so hoping I can find them around here! <3 Beautiful. Hope you find some. You’ll love it too. And as you probably noticed it is so easy to prepare! Next time I’ll have to make sure to buy two each for the guys though. It is that good. The shelf life of these are amazingly long! I actually bought them over a month ago and finally cooked them the other day! They are so decorative it’s not a bad thing to have them in the vegetable keeper on the counter for a long period of time. Have a good week! One of my favorite foods in the winter – roasted squash. They go with so many other foods on the menu. That’s it. Sweet potato and butternut, good description! Don’t you just love soft foods like this? And when you describe it as buttery and creamy…awww, what more is there to say? :) Always nice to hear from you Shanna. Awww, shucks. :-) Thank you, Seana. Do love your blog!!!!! 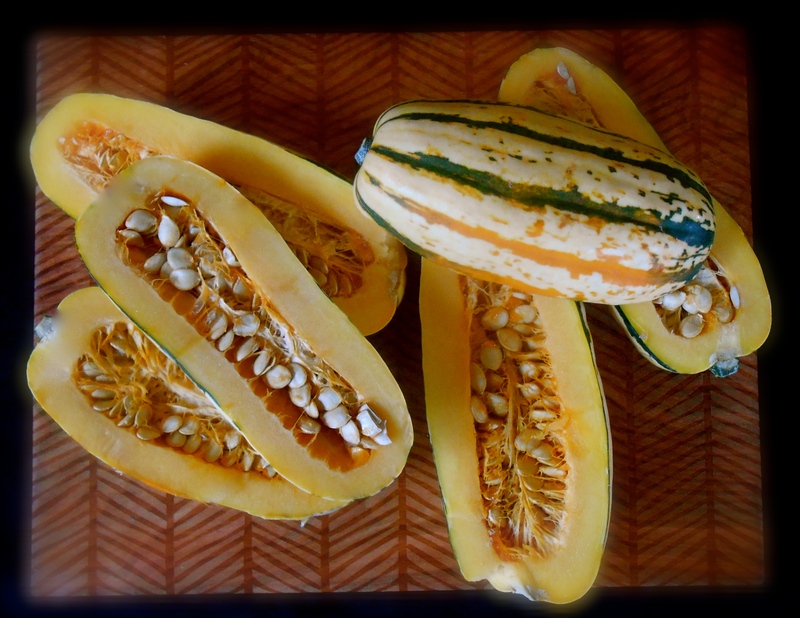 Delicata really is at it’s best roasted, I love it, your bowl of squash is just beautiful. Thank you. :) I was just thinking about your oat pancakes seconds ago. I’m headed to the kitchen right now to make them. It’s a late breakfast for me, but I have not stopped thinking about them since I read your post the other day. I am going to make them your way, with cow’s milk. I’ll let you know how much we enjoyed them. These look beautiful and easy to prepare. 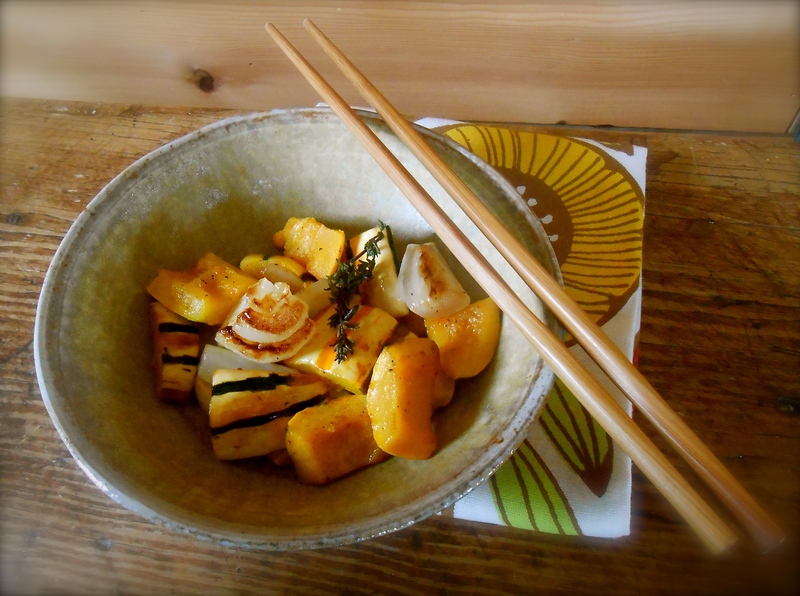 I love trying all the different squashes too and will look for delicata next time. I recently went to a ramen shop and they served very similarly roasted and thinly sliced delicata squash over the ramen. It was a fun way to eat delicata squash. Thanks for the recipe! Oh my goodness! I would love this on ramen. Thank you for stopping in and commenting…great idea. I imagine adding a nice soft texture to the stuffing would be wonderful. I really love stuffing and I usually only make it once a year. I don’t know why. I think I’ll make some soon and add delicata squash to it. Sounds lovely. I have never heard of buttercup so I looked it up and sure enough I have seen it before, just never thought to buy it. I’ll try it next time. I love the names too, just makes you want to eat it! I always love learning something new. Delicata squash are new to me. At first – when I read your description of butternut – I had to agree. I love butternut and buttercup squash. But no-peel squash?! I’m in. Just have to hunt them down. Lovely post as always. Hi Lindy. I really don’t make winter squash too often, it seems so troublesome. But every time I make it I love it and this delicata was by far the easiest. They’re a little more tender so the knife went through easily and he seeds could be roasted too. I didn’t roast the seeds…lazy I guess. I’m going to seek out buttercup next time, must be good if you like it. I love it. Here in Ireland, it’s butternut or nothing in our supermarkets. I love your “squash display” reference. Thank you…I’m always so surprised to see 7 or 8 different varietals and I often wonder if they all taste similar. Most likely they do. Yummy. I adore squash but have never heard of this one (like you, I get butternut), and I love the simple preparation of your dish – thyme and butter and melting soft squash. Delicious! This was so much easier to cut than butternut. It really is worth a try, and yes! you can roast the seeds, I was lazy and didn’t do it this time. Would be wonderful to roast them crispy, salt them and sprinkle them on top of this roasted dish though…. Thanks for introducing me to this type of squash, might be a interesting addition to the garden! This looks lovely! I actually have never cooked delicata squash — always mean to, but then reach for butternut or acorn to take home with me from the market. More encouragement to give it a try! You sound like me! I like acorn too, it is a nice size to stuff. We are fortunate to have such a variety of winter squash and here I don’t even venture out and try them. Nice to hear from you! I love that you can also slice them thin and cook on the stove top pretty fast compared to most winter squash. Butternut squash is my default winter squash too. I have one on my kitchen counter as I type this and it’s slated for the soup pot! There’s no chance of finding that here. Only butternut. I still have a Harlequin squash left from Hallowe’en, which is still okay to use. Problem is, it looks so lovely and bright in my kitchen! I can’t bear to use it. Unless I do make a nut roast, like I’ve been threatening to do for ages now. Hope you’re managing to get rid of that cold! Harlequin squash? I had to look that one up and we actually call it acorn squash over here. It’s wonderful! Incredible you have had that since October and I agree they are so lovely. A nut roast has me very curious. After 6 days the cold has vanished! Sleep. That’s my cure. It works! I love butternut squash, too! Thanks for sharing about this other squash. I have never seen it before, but will look for it now. I appreciate the suggestion. Looks great! I love the pictures! I think I would like it even better with sage. Although I like thyme it’s not my favorite when paired with vegetables. It’s what I had on hand, however, if I do this again I’ll make sure to use sage. And I’ll improve upon the appearance too by slicing in thin rings. Thank you for the wonderful suggestions Ken. Haven’t seen a delicata squash but they look so beautiful. Your recipe sounds delicious but what I really love is that floral serviette! It’s funny, I always go for butternut, acorn or spaghetti squash and haven’t tried delicata. I think I have to do this. What a great simple recipe. You are currently reading roasted delicata squash at COTTAGE GROVE HOUSE.